Uncategories What could a NDP victory look like? Polls are currently showing a Conservative majority with probabilities around 70%. This means a NDP victory next Thursday is possible but would require some surprises. In this blog post, I will go through one scenario that ends with Andrea Horwath as Premier. It isn't a purely fantasy scenario where the NDP gets 50% of the vote or anything. No, I'll use the current projections and make some minor changes. But first, here are the most up to date projections. I just added the Mainstreet tracker of yesterday (showing the PC back on top) as well as accounting for the riding poll in Guelph showing the Green leader first. At the bottom of this article you can find the riding by riding projections that will serve as our baseline case. Alright, the NDP needs 13 more seats compared to the projections. Let's see the ridings that could be changed. The theme for this scenario will be the NDP surging in very urban areas. We'll leave most of the 905 to the Tories. We'll also not go with the scenario where the NDP is severly underestimated in the polls (although this is a possibility). We'll simply flip some ridings here and there. 1. Guelph. Mainstreet published a second riding poll yesterday and it confirmed that Mike Schreiner was ahead, so I updated the model (even though I continue my decision not to use most of the riding polls as I believe they don't match up with the province wide ones. In this case however, we got two polls that showed the same results. Also, I can absolutely imagine the Green benefiting from the collapse of the OLP there). But the lead of the Green leader (3.9%) is small and smaller than the margins of error of the poll. Also, the riding polls of Mainstreet have been underestimating the NDP consistently. So let's assume that the NDP manages to grab this riding. It could be helped by some undecided ultimately going for the best option to defeat Rob Doug Ford. 2. Two of the three Don Valley (East, West and North). Current projections give the NDP some low chances there. Don Valley East is by far the easiest pick but those are urban ridings. The NDP mostly needs half of the Liberal voters to rally around them. Maybe Kathleen Wynne admitting she knows she won't win would be enough to move these voters. 3. Eglington-Lawrence. Projections aren't super favourable but that's one of the riding polls where the NDP was higher than in my model. Keeping with the surge in urban environment, this could make sense. 4. Scarborough-Guildwood. Currently one of the two Scarborough riding not going NDP, the NDP just needs a little bit of a push to win there. 5. Toronto Centre and St. Paul's. 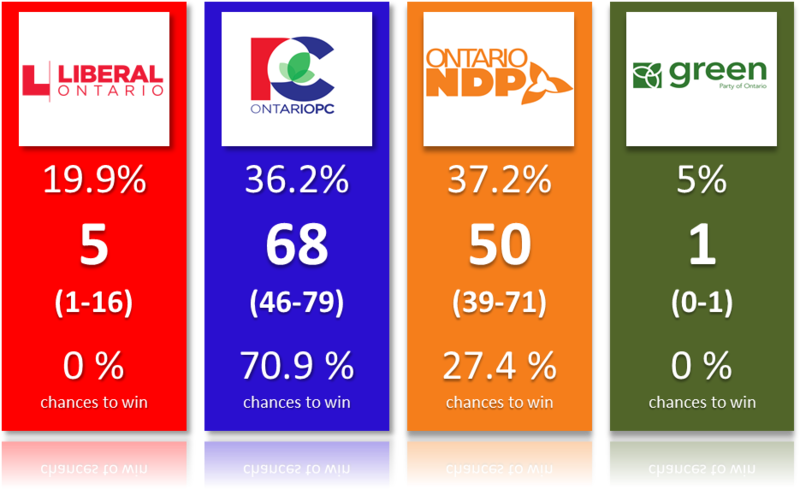 The former is almost a perfect toss up in the projections but riding polls were putting the NDP easily ahead. Similar story for St. Paul's. These are two ridings that could go NDP with the collapse of the Liberals. Ok we are halfway there! 6. Willowdale and York-Centre. We are getting a little bit far from the city core though. But that's still the 416 and it still fits our scenario. Not gains but for this scenario to work, I'm assuming all of Brampton goes orange. 7. One extra riding in Mississauga or Etobicoke-Lakeshore. There as well riding polls aren't very good but let's assume one surprise victory. The model seems to indicate that it should be possible in Mississauga. 8. Three Ottawa ridings; Vanier, West-Nepean and South. Both the model and riding polls are showing close races. Let's factor the usual collapse of the Liberal vote and a rally to the NDP and these can flip. Here we are, the NDP is now at 63 seats and forming government. What did it take? A relatively basic scenario where the NDP is surging on Toronto proper and Ottawa, as well as getting lucky in one or two ridings in the suburbs. In most of the ridings here, the NDP's chances are already projected around 30%, so it's not like winning would be a monumental surprise. I did include some ridings with fairly low chances though (around 5%). So let's see if we can have a little bit of a buffer. Let's add Sault St. Marie to the list. We can also put Kitchener South-Hespeler. They can replace two of the ridings above. Look, of course I'm looking at a very optimistic scenario for the NDP. But my point is to show that it's not that hard to picture a path to 63 seats for this party. It doesn't require to flip seats where the NDP is 30 points behind. Let's put it this way: remember last US election when so many pundits where saying there was no path to 270 for Trump? And then, 3 hours into the night, we started realizing that Trump actually had more path than Hillary simply because he flipped a couple of states in the midwest? I'm not comparing the NDP to Trump, I'm simply saying that we often think there is no way and then be surprised. My scenario here above would allow the PC to win most of the suburb and win almost everything in the rural part of the province (except the North). That's not a stretch. The fact the current chances of winning are almost exactly the same as for Hilary Clinton and Trump is just an amusing coincidence. Look, whenever a party increases significantly between two elections, there are always ridings that flip that we never thought would. If the NDP really wins the popular vote by jumping to 37, 38 or 39%, I'm convinced such surprises will happen. They always do. My model isn't even smart enough to actually include correlations across ridings that are similar (outside of being in the same region; But no socio-demographic variables unfortunately) and yet it gives the NDP around 30% chances of winning! So when I see the CBC poll tracker giving the NDP only 9.1% chances, I find it ridiculous. Finally, uncertainty works both ways. I could easily do the same exercise for the Conservatives and have a scenario where Ford wins a super majority of 80 seats. Do not interpret this post as me saying that this is what will happen. I simply wanted to illustrate how possible a NDP majority was. In other words: do not assume that this election is over.